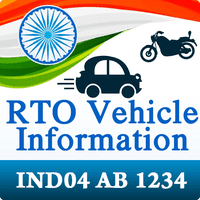 RTO Vehicle Information Android App Best app for all india rto vehicle registration number search.you can find vehicle registration details of all india addresses in seconds. Note : We are gathering vehicle information from the Government Departments and showing it without any modification. In case of legal procedure we highly recommend to consult with respective department in the city/state. This app works for 100% as this is from a know government records. If you find any problem in fetching car details, do write it to us and we will solve it out as soon as possible.